The development of the Jupiter Icy Moons Explorer (JUICE) space probe is progressing well. 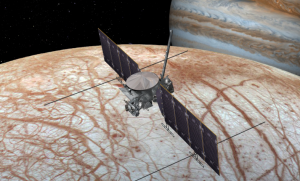 The launch of the ESA space probe is scheduled for the summer of 2022, to go into Jupiter’s orbit in 2030. This is one of the most ambitious missions of the European Space Agency. JUICE will have to study in detail three jovian moons : Europa, Callisto and Ganymede, which are candidates to shelter a liquid ocean in their depths. These are therefore very interesting choices for the search for extraterrestrial life. Europa and Callisto will be studied during overflights, then in 2033 ESA will try an orbital insertion of JUICE around Ganymede. This should advance our knowledge of these distant but promising worlds. In the meantime, a test model of the Jupiter Icy Moons Explorer space probe is being assembled by Airbus Defence and Space. The objective is to verify on Earth if the electronic components of the space probe will be able to survive the magnetosphere of Jupiter.